=Marspedia Editorial Subcommittee= This was our 3rd meeting and was convened as a teleconference using the Zoom.US service on November 8, 2017. ==Attendees== Susan Martin, James Burk, Bruce Mackenzie, Nicole Willett, Kerri Miller (had to leave early), Bart Leahy, Mike Delaney, Richard Trombly ==Agenda== * Logo Design * Nicole's Article Submissions * Talk about Topic List & Needed Articles pages ==Minutes== ==Logo Design== We discussed some ideas for a new logo for Marspedia. Susan Martin recently spoke with the Director of Communications at SpaceX about us using some of their recent Mars colony images (which they declined to give us permission for, unfortunately), but she gave us a contact for working on new images and gave some advice on what a good logo might be -- it could be a symbol or icon instead of an image, that could be recognizable and used more widely. James and Susan both have contacts and agreed to contact them for this. ===Nicole's Article Submissions=== Since Nicole was on the call, we talked again about her article submissions and how to proceed with posting to the site. Nicole again agreed on the use of the CC BY-SA license and that she wanted to edit them a bit. James said "that's the beauty of a wiki", that we could post them but not link up to the main page and she could edit online. We agreed to proceed with that, and link up once they are ready. Nicole also agreed to eventually rewrite them or have K-12 versions. Nicole also mentioned her blog [http://education2.marssociety.org/category/redplanetpen/ Red Planet Pen] on the Mars Society Education site that has material we could pull from. 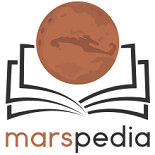 ===Talk about Topic List & Needed Articles pages=== We reviewed the [[Marspedia:Topic List|Topic List]] and [[Needed Articles]] page. We feel like the Topic List is comprensive now. We now need to flesh out the Needed Articles. Everybody is empowered to update these two pages with anything else needed. Susan mentioned doing a call for volunteer articles. Bruce mentioned getting Journalism students involved with Marspedia, and that some colleges have required internships. ==Action Items for Next Week== * James & Susan: contact designers for a new logo. * James: Post Nicole's articles to wiki but do not link up with home page / teacher's page. * Nicole: Edit articles. * Bruce: dig up & send whitepapers with Mars settlement concepts. * Everybody: Continue to add to Needed Articles page. Return to Marspedia:Editorial Minutes 11/8/2017.